It's our last week of SBO DT projects using Karen Foster Designs. This week was all about baseball. I took Ian out in the backyard to hit a few balls, and guess who joined in? Rusty just about had a fit trying to get the ball, so we decided to make him part of the photo shoot. So glad we did! Details for this layout are here. 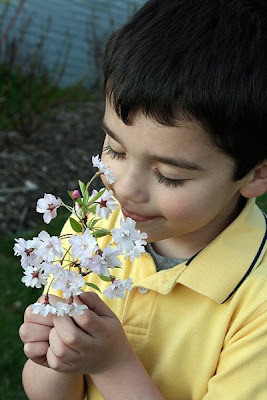 In case you haven't noticed, it's spring! I grabbed a few photos of the boys enjoying the warm weather tonight. Be sure to check back in the next few weeks - you are bound to see them on some cool layouts! My good friend Cheryl surprised me with the Arte y Pico award this week. As is tradition, I will pass the award along to other creative souls who share their art with the greater population by blogging. I hereby award Lauren, Jen, Stef and Kjirsten this award. Now go check out their stuff! It's challenge day at Caardvarks! 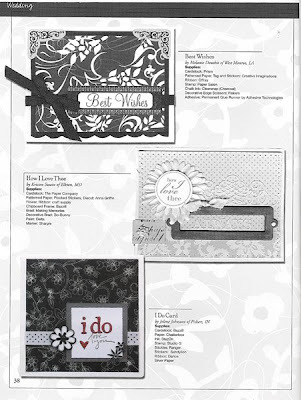 Make us your best card(s) using black & white plus 1 color and link them back to 'Varks by midnight on May 1st to be eligible to win an awesome kit from Penguin Pants stamps. 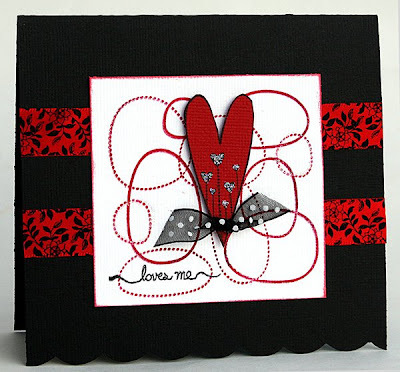 My first card used my favorite color combo of all time, black and white with red. Details for the card are here. My second card used the same Penguin Pants heart stamp as the main image. 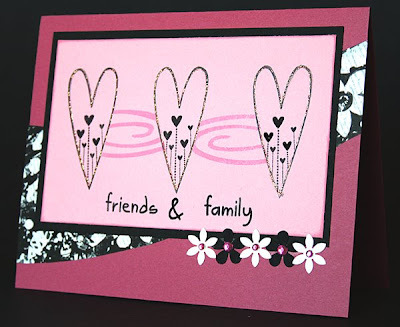 I masked the hearts and stamped the swirl in pink between them. The sentiment words are also from the same set of stamps. 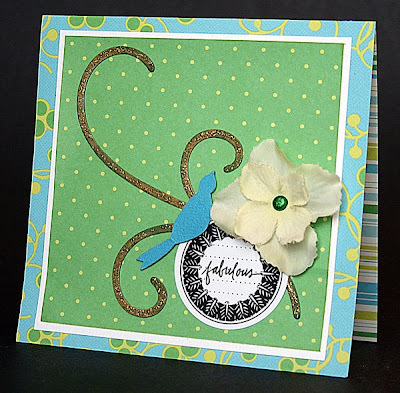 A little Dollar Tree paper and some punched flowers with bling finished this card off. Details are here. Can't wait to see your black & white + 1 color cards at 'Varks! Nothing like starting out your morning with an earthquake! Good times, good times. On to the artwork! My first project is made with Karen Foster goodies, our sponsor at SBO this month. The photos are of hubby's great grandfather and great uncle. How cool is that? Details are here. My other project was for a special SBO article all about ribbons. 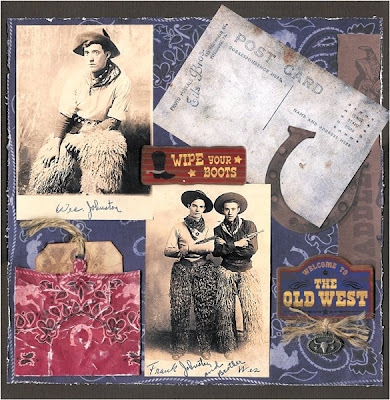 Take a look, there are some great projects there that cover cards, layouts and altered art. 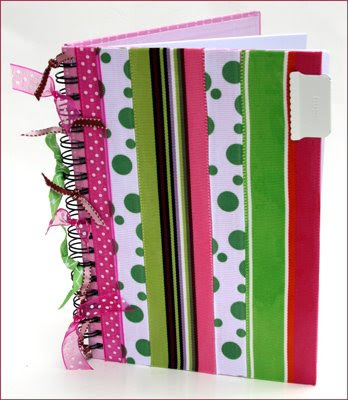 Details for my notebook can be found here. Time to share! 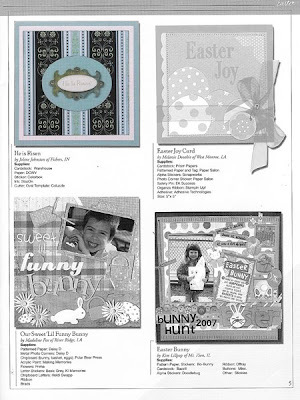 Here are the two cards I had published in Hobby Lobby's 2nd quarter 2008 magazine, available at Hobby Lobby stores now. 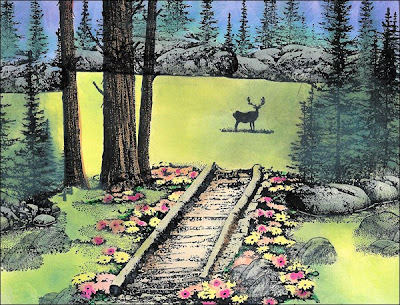 Click each page for a closer view. The first card was actually made for their religious book call but was accepted for their regular spring publication. The wedding card shown below was a last minute entry and one of my favorite cards ever. Since the card is black and white it doesn't exactly show up so well in my "highlighted" version below. (It's the bottom left card.) Thanks for looking! Ok, two posts in one day? Well, it's only because I made a big oops! and forgot to post the new (Some) Assembly Required challenge on my own blog. 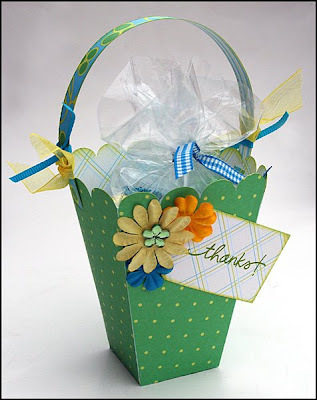 April's challenge is to create a container to hold sweet treats of some kind. Here's my Cricut-created container with a supply list. Check out all the details for the challenge here including the awesome prize pack you can win! It's a microchallenge at Caardvarks! Our new Branching Out challenge is all about trees of any kind. Have your card(s) linked to 'Varks by Sunday April 13th at midnight. 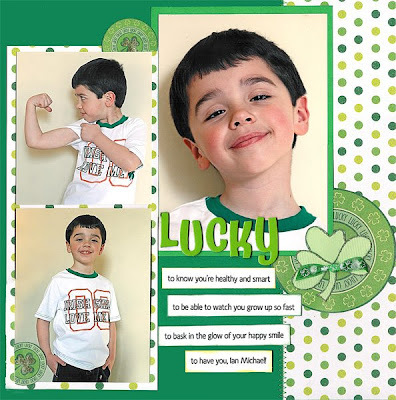 The winner of this challenge will receive a few small stamp sets by Penguin Pants! I engineered my palm tree creation above with considerable coaching from my friend Celeste. The tree and two shapes used to make the sun came from my new DoodleCharms cartridge for the Cricut. Details are here. This card was a lot easier to make. 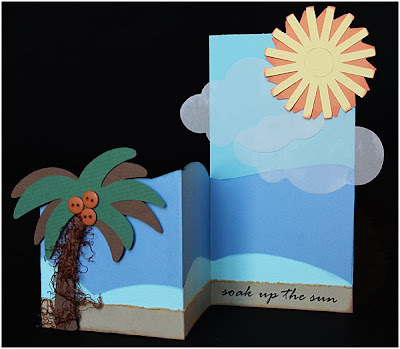 It uses one small strip from one sheet of paper and several colors of cardstock. 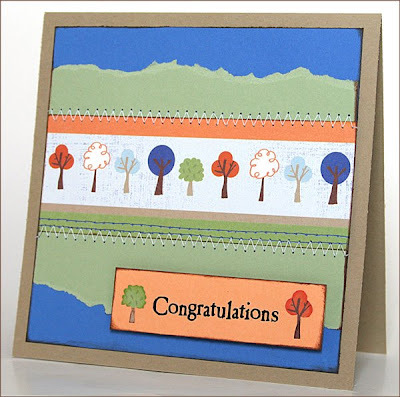 The trees around the sentiment were handcut to use as embellishments. Details can be found here. So why not go out on a limb and try this challenge? 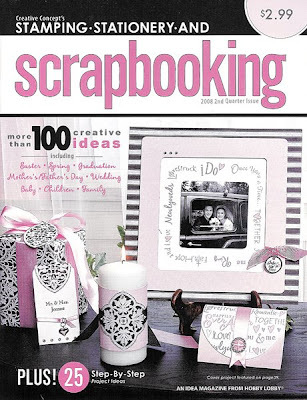 The Design Team at Scrapbooker Online is hosting color combination challenges for the month of April. The first colors up are cream, chocolate brown, robin's egg blue and green. Here's what I made using those colors. The rub on frame was a serious PAIN to apply, but the effect makes the effort totally worthwhile. I added the rub on words and arrow at the end. The photos are what make this layout for me. Matty is such a ham (and he totally knows it!) Details for this layout are here. 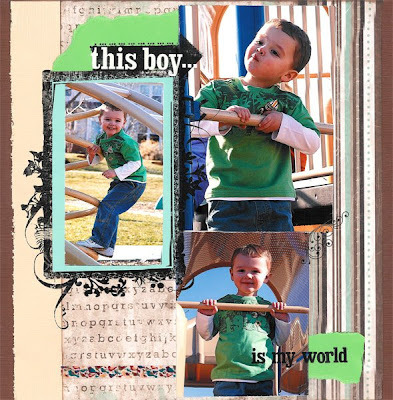 Come join us and try your hand at scrapping with these yummy colors! It's challenge time at Caardvarks! 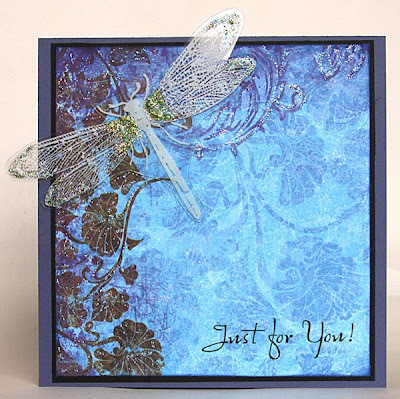 Today we opened our Flight of Fancy challenge to make a card that includes things with wings. Cards need to be linked back to 'Varks by midnight on April 17th to be included in the chance to win this stamp set from Penguin Pants. Be sure to stay tuned for our April 20th challenge which showcases stamps from Penguin Pants. Details for the card above can be found here. More winged things. This one features an acrylic dragonfly by My Mind's Eye. Details here. 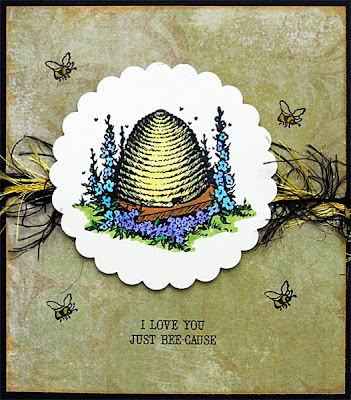 The card below goes a little old school with a stamp by PSX and a rub on sentiment by Karen Foster that matched perfectly. Details are here. Can't wait to see your cards! I feel very lucky. I am blessed with an amazing husband and two beautiful, healthy sons. And once in a while I get around to actually writing that down for others to see and for my family to read about long after I am gone. I made this layout about Ian using Di Hickman's April sketch. You can find the details here. 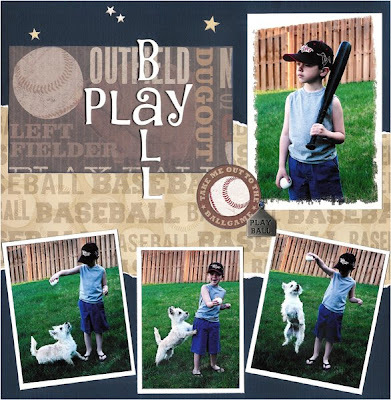 On a completely different note I stamped this scene using Stampscapes stamps for a class I'm teaching at the end of April at Scrapbook Corner. If you're local to the Indianapolis area or are within driving distance, look me up! 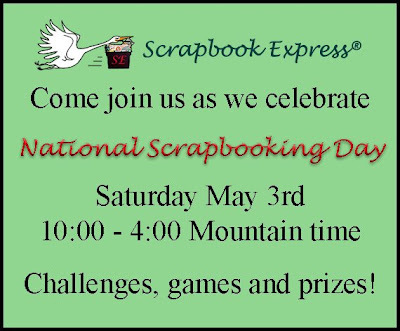 My last bit of lucky news is that I was invited to join the card design team for Scrapbook Express today. I am excited to work with the owner and designers there. Check it out!